It is argued that the artistic poet-souls of the Upanishads lived in the world of diversity and did not fly out of it . This does not mean that the sages were tied to the plurality-consciousness of the temporal world . They transcended earthly consciousness and realised that the earth is Brahman itself illumining . But in such a realisation there is no concession given to the reality of diverse appearances in any case . The conception that the world is God’s revelation of Itself does not fare better . Revelation again presupposes the operation of the play of space , time and causation , the final validity of which is already repudiated . A GOD who changes Itself is not a permanent being . God’s self-revelation requires a change in the total existence itself , which process is logically inadmissible . Divine revelation is in relation to the consciousness of the individual and is not an eternal fact of existence . Existence is itself full and perfect and dissipation within it is not admitted by reason . The denial of multitudinousness does not , as it is sometimes supposed , reduce the rich life of the world to a dream-shadow . It is not known how variety in existence adds to the richness of the Absolute . The richness of the part is not equal to the magnificence of the Whole . The grandeur of the relative world is dependent on the imagination of the individual . To a person who has opened one's eye of true consciousness the world does not appear as such . We cannot see any cogency in the argument that it is possible to have worldly enjoyment together with the knowledge of the Absolute . It is further contended that even if the Atman is the sole reality , the existence of plurality cannot be denied. If the Atman is the sole reality , it is to be accepted that it is without internal or external differentiations . If there is thus no plurality in the Atman , and also if nothing exists but the Atman , there is no meaning in holding that existence is inclusive of plurality . If the Atman or Brahman is non-dual , there can be no plurality , because other than Brahman anything is not . 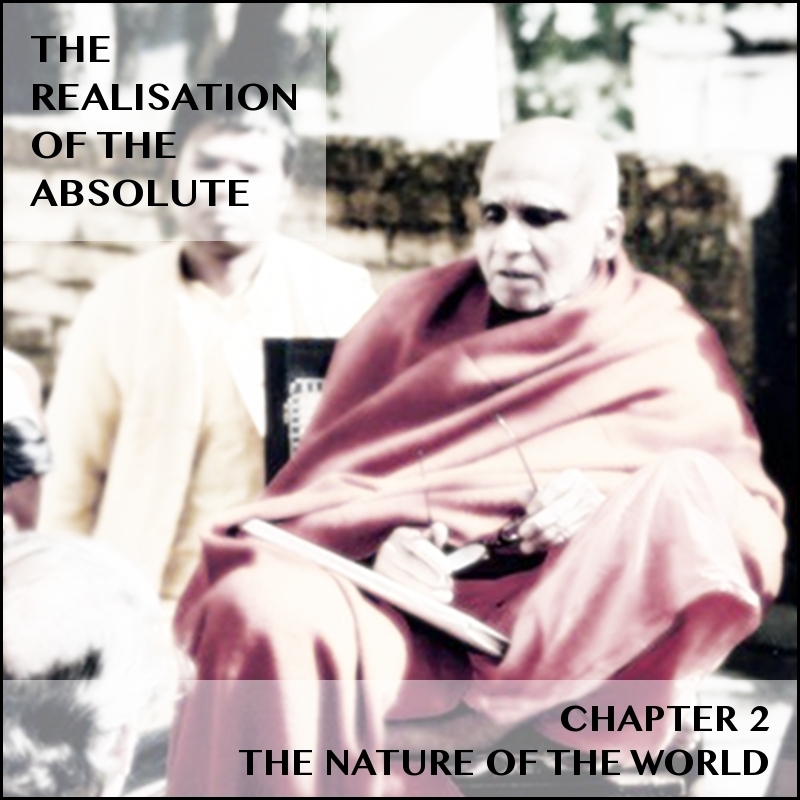 The view that , because it is said that with the knowledge of Brahman " all " is known , Brahman-realisation does not destroy plurality but merely renders the person immune from objective attraction , and that " all " implies the existence of plurality , is a misunderstanding of this sentence . The word " all " does not refer to the reality of the plurality of things . It is only a symbolical expression of the Upanishads used for want of words to express unlimitedness . When we say " all " is known , and " all " is Brahman , we do not mean that the trees and the mountains , the sky and the ocean are Brahman differently . If they are all one , and if Brahman has no heterogeneous qualities , the assertion, " all " is known , does not imply plurality in the natural essence of Brahman . Space and time are swallowed up in the being of the Reality and plurality cannot exist unless there is something second to Brahman , which persists eternally . Eternal duality or plurality is impossible , as can be seen from an examination of the nature of Consciousness , and we are compelled to admit the homogeneous character of Brahman’s essence . If being and becoming are identical , the cause of the appearance of the world must be attributed to some mysterious and inscrutable ignorance and cannot itself be given a place in existence . Duality cannot survive and individuality cannot exist in the Truth of Brahman .
" Where there is duality , as it were , there one sees the other , — but where everything is one’s own Self , then , whom would one see ? " —Brih. Up., II. 4. 14.
" Where one sees nothing else , hears nothing else , understands nothing else, that is the Infinite . "